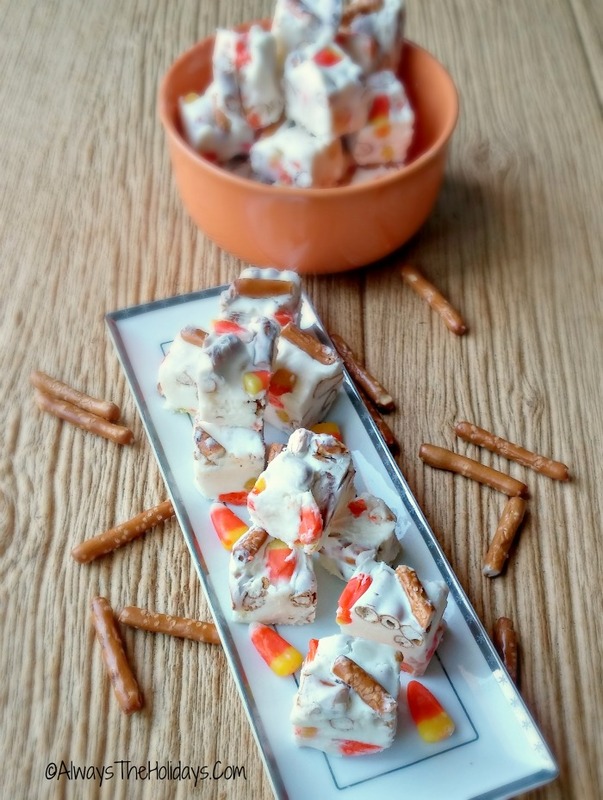 This candy corn pretzel fudge has my favorite holiday candy, plus pretzels and lots of other goodies. It will disappear from the table at Halloween or Thanksgiving. October 30 is National Candy Corn Day. Many national days are associated with food. What more perfect way to celebrate than with a piece of this delicious fudge? Find out all about these special days in my National Days Guide. Fudge is one of the most popular forms of homemade candy, especially around holiday time. There is even a national candy day in November! 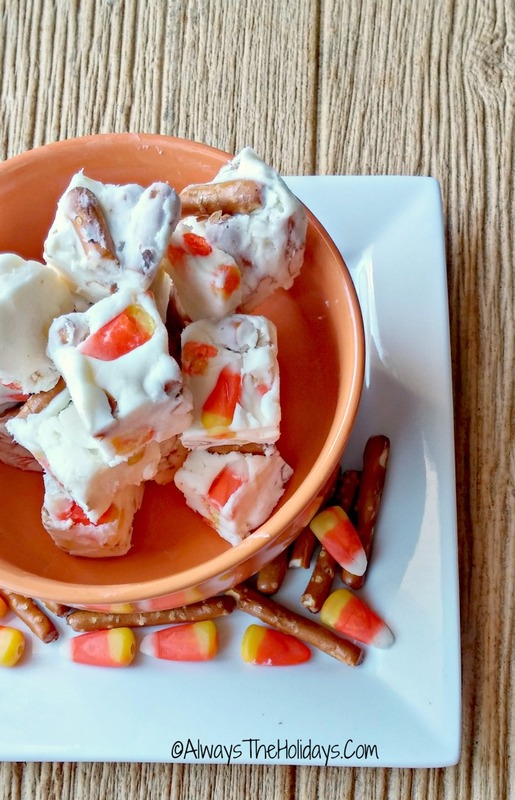 This candy corn pretzel fudge is sure to become a holiday favorite. This fudge has everything. It is both salty and sweet and is so decadent and rich, it will satisfy any demanding sweet tooth! I love the way the top of the fudge looks too. There is no mistaking what is in it is there? How can the fudge not be good with all those things in it? Start by chopping your pretzels into pieces and mixing together the marshmallow and white chocolate. I saved a few candy corn pieces and pretzel bits to put on the top of the fudge after it is made. I find that separating things into small bowls makes it easier, particularly with fudge that often sets quickly. Also be sure to line your pan with parchment paper or aluminum foil before you start cooking the fudge, so that it will be ready to pour the mixture into it. This lining makes it much easier to take out of the pan later. Now it is time to cook the fudge. Place the cream butter and sugar in a saucepan over medium heat and cook gently until it comes to a boil. When you can make a soft ball out of it, it is set. When it’s not set, it is runny and won’t form. 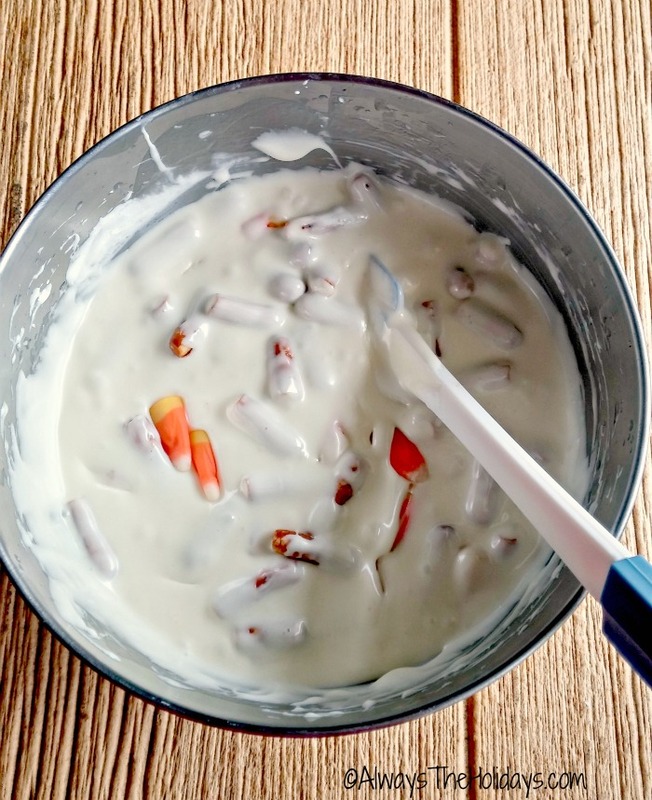 Place the white chocolate and marshmallow fluff mixture in the bowl of a stand mixer. Pour in the cooked butter and cream mixture and beat it well it is smooth and creamy. 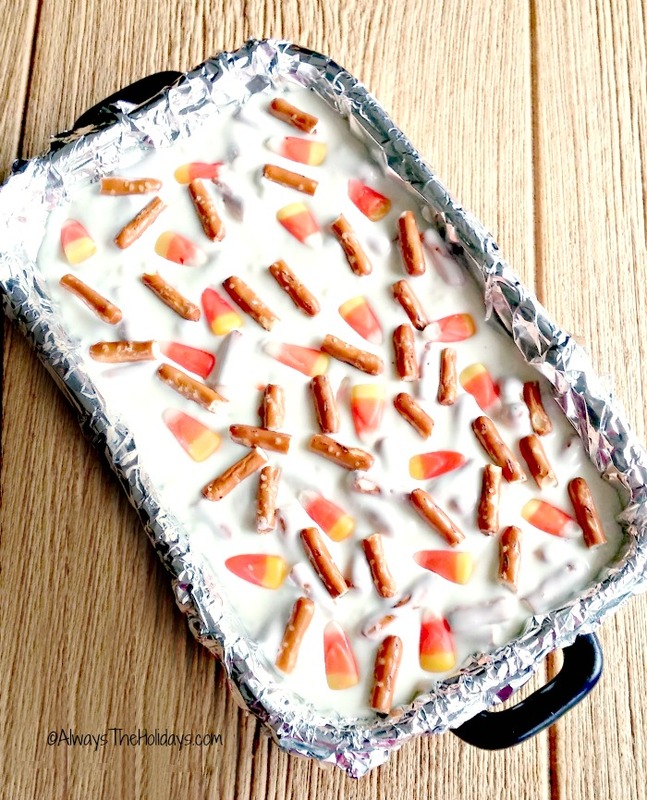 Pour the fudge mix into the prepared pan, decorate with some candy corn and pretzel pieces, and place in the fridge to set. When the fudge has set, cut into pieces and serve. It makes about 40 one inch size pieces of fudge with around 175 calories each. I love the texture of this fudge. It has a bit of a crunch in it from the pretzels and the salty sweet combination is so tasty. I am so glad I made this super fudge! It is sure to be one that I make each year from now on! For another take on this recipe, see these candy corn pretzel no bake balls. What is your favorite holiday fudge flavor? Please share your ideas in the comments below. This delicious fudge combines your Halloween candy corn with pretzels for a sweet and salty treat. 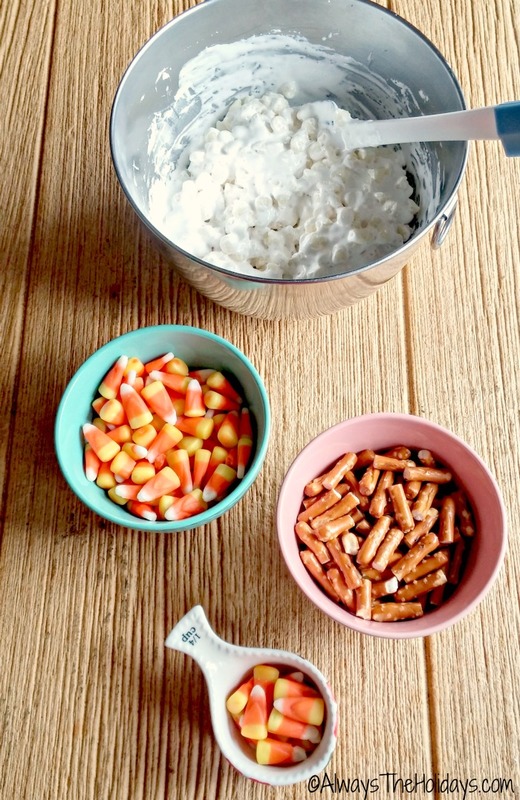 Place the candy corn and pretzels in small bowls. Save a few of each for garnishing the fudge in another bowl. Line a 9 x 9 inch pan with parchment paper or aluminum foil. Combine the marshmallow fluff and white chocolate chips in the bowl of a stand mixer. Place a saucepan over medium heat and cook the sugar, heavy cream, salt and butter until it comes to a boil. Continue cooking for 7 minutes. stirring the whole time. Be sure to cook the mixture until a soft ball forms in water. Add this mixture to the marshmallow fluff and white chocolate in the stand mixer and beat until it is smooth and creamy. 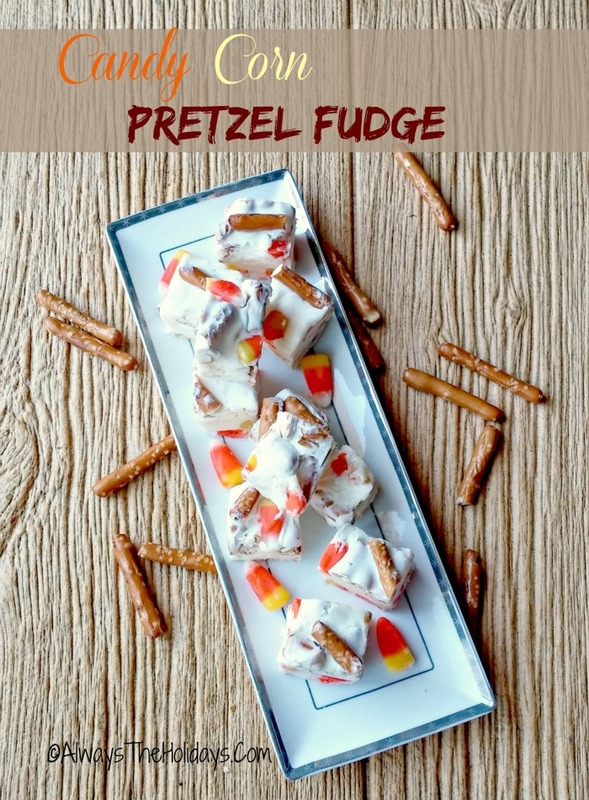 Add the candy corn and chopped pretzels and mix well (be sure to save some candy corn and pretzels for the top of the fudge. Pour into the prepared pan and smooth out. 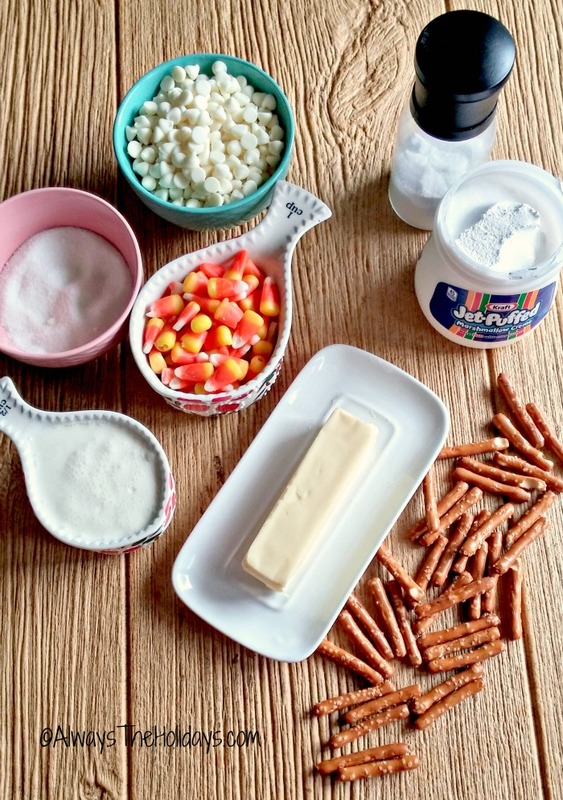 Add the reserved candy corn and pretzels to the top and place in the fridge to set for several hours.